Dreaming of a new home on a large lot in an outstanding neighborhood? The Preserve features lots that are a half-acre and larger with curbed streets, underground utilities and some of the highest driest land in Santa Rosa County. The "Riordan" floor plan is on 0.509 acre and features granite counters in the kitchen, Mohawk wood laminate flooring throughout the foyer and family room and tile in all wet areas. The large open kitchen boasts Aristokraft cabinets (or equal) an appliance package, large pantry, and a breakfast area. The large family room is open to the kitchen as well as the covered lanai. This magnificent home features a Master Suite with 2 walk-in closets, tiled shower, comfort height double vanities, soaking tub & water closet. 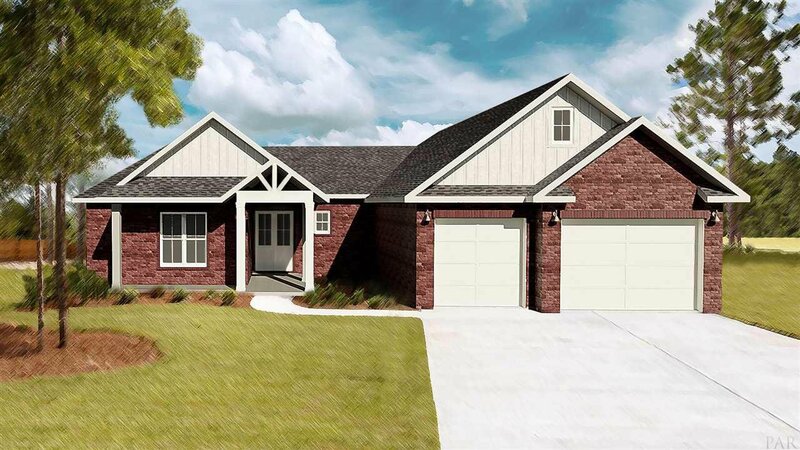 On the opposite side of the home you have a 3 large bedrooms, 2 full baths and one half bath laundry room & mud room w/entry from the 3 car garage. Exterior features: An open Lanai, landscape package w/sprinkler system, upgraded front door, 30 year architectural /dimensional roof, ridge vents, vinyl soffits. Energy saving features: R-13 & R-38 insulation, vinyl double pane windows with impact glass, and ceiling fans in the great room, flex room and all 4 bedrooms. This is your opportunity to build a SUPERIOR CUSTOM HOME at an AFFORDABLE PRICE! Listing courtesy of Venture Realty Svc., LLC.